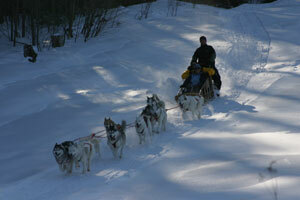 Experience the thrill and excitement of a dog sledding adventure in the Green Mountians of southern Vermont. 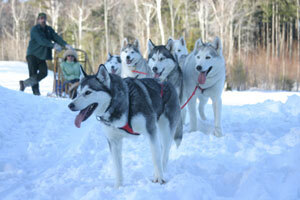 A team of our friendly Siberian huskies will take you on an exhilarating ride on our network of groomed woods trails. With a musher as your guide you will get a chance to witness true working sled dogs in action, doing what they love to do... run! 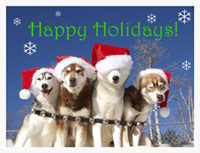 Your adventure begins with an introduction to the kennel and the dogs that will be pulling your sled. We will demonstrate how we harness the team and give you an overview of what to expect. The real excitement starts as we hook up the team and start your guided tour travelling through Vermont's scenic winter landscape. Please allow 2 hrs. for your guided tour. Total combined weight of passengers not to exceed 330 lbs. per sled. This thrilling tour will take you on a wilderness adventure that has it all. The tour will begin at the kennel, take you over a bridge, through a field and onto a series of wooded trails. Our trails will bring you back and forth up a mountain to a stopping point with spectacular views of the Newell Farm and the back side of Stratton Mountain including the Sun Bowl. However, the tour is not over yet, as you get to travel back down the mountain, over streams and back to the kennel. Along the way look for signs of wildlife and with some luck you may get a chance to spot a deer, fox, or snow rabbit.